Since its signing in 2010, the ACA has provided health insurance to nearly 30 million Americans and reduced the uninsured rate to a historical low of 11 percent. It has barred insurance companies from discriminating against patients with pre-existing conditions, allowed young adults to remain on their parents’ insurance plans for an extended period, and expanded coverage for preventive, mental and women’s health care. Furthermore, because implementation of the ACA has required a radical restructuring of the health insurance marketplace, immediate repeal would severely destabilize the health care economy, hurting patients and hospitals. Recognizing these dangers, medical students have acted urgently to forge a coalition called #ProtectOurPatients. Under this umbrella, students published an online petition urging Congress to consider the consequences of an ACA repeal. To date, the petition has amassed more than 4,500 signatures and sparked collaboration among students from medical schools and congressional districts nationwide, and with several large national organizations, including Doctors for America, the National Physicians Alliance, the American Medical Student Association and Physicians for a National Health Program. 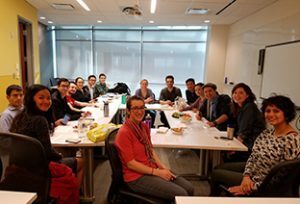 Several Johns Hopkins medical students have been integral in the organization, planning and implementation of these efforts, which they say are driven not by politics, but by a concern for the well-being of patients. They have been collaborating on efforts to circulate petitions, draft op-eds, hold phone-banking sessions to call legislators and more to make their voices heard as the future of medicine in America. Justin Lowenthal, one of the Johns Hopkins organizers, explained to me why this work was so important. “Though early in our training, each of us already has stories of patients we have helped care for and whose lives have been saved or health improved due to the coverage expansion under the ACA. Politics aside, it is very important to many of us that these gains are not lost,” he says. On Jan. 9, Lowenthal was joined by Johns Hopkins medical students Maria Phillis and Marc Shi for a day of activism and lobbying in Washington, D.C., organized by the #ProtectOurPatients coalition. A passionate group of students started the day outside the Department of Health and Human Services, “to make known our desire that the ACA be saved and to thank HHS for all its work in the implementation.” Then, they migrated to Capitol Hill, where they spent an hour calling on Congress to save the ACA. The demonstration was powerful, with coordinated chants, poster displays, three minutes of silence for the 30 million at risk of losing their coverage, stories from patients and medical students about the good the ACA has done, and a roll call of senators. L ater, students fanned through the Senate office buildings to meet with senators and legislative aides from both parties, delivering their petition and discussing the request to improve rather than replace the ACA or, at the very least, ensure that any replacement occurs simultaneous to repeal and offers similar or better coverage. Phillis says some of the meetings were “very warm and productive,” while others were “more frustrating.” Her favorite moments from the day included speaking with Ohio Sen. Sherrod Brown’s staff and meeting a number of prominent senators during a Facebook Live event. Remarking on an opportunity she won’t soon forget, Phillis “talked to Elizabeth Warren live on the video feed about the importance of maternity care coverage in the ACA.” On the same day, other students, including Ilan Caplan, coordinated a day of phone banking in Baltimore as part of a national effort among medical schools across the country to draw attention to the repeal of the ACA. 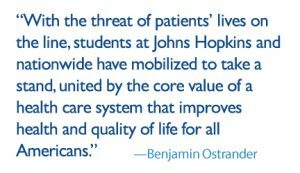 With the threat of patients’ lives on the line, students at Johns Hopkins and nationwide have mobilized to take a stand, united by the core value of a health care system that improves health and quality of life for all Americans. If you are interested in getting involved in the #ProtectOurPatients campaign, please contact Justin Lowenthal at jilowenthal@jhmi.edu or Maria Phillis at mphill58@jhmi.edu. The Nuances of Health Insurance: It's essential for health care professionals to adeptly navigate the health insurance system in order to act as the best advocates possible for patients.